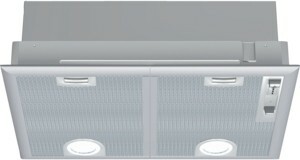 The NEFF D5655X0GB Canopy Hood is capable of extracting 650m³/h and is suitable for ducted extraction or recirculation. The 2 halogen lights will illuminate your hob area during cooking. There are 3 speeds and an intensive setting to choose from using the slide control. While, 2 metal grease filter cassettes can be easily removed and replaced or cleaned.